The dictionary defines affirmation as emotional support or encouragement. To affirm someone means to offer them emotional support or to validate. Some of the synonyms include add to, develop, promote, improve, boost, enhance, reinforce and strengthen. What powerful words! I often hear people, and not just young people, putting each other down. Sometimes in the name of teasing they say things that can be taken as hurtful words. Words that can undermine confidence, weaken another’s resolve or injure the self esteem. Our words are powerful. We can use them to affirm, to build up or to tear down and discourage. 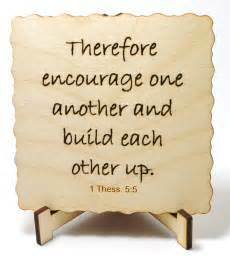 God’s Word tells us to build one another up, encourage and affirm them. 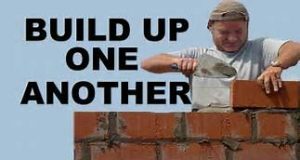 Just like this brick layer in the picture adds one brick at a time, securing them solidly, so God wants us to speak into other people’s lives and show with our actions that we are adding to the puzzle of their life rather than hiding pieces they need to be encouraged in their journey. I have a file of notes which people have given or sent me. These notes have words of affirmation on them, encouraging words which have helped me realize that God has gifted me with the ability to tell stories that encourage, teach about God and uplift people. When I listen to God and use these talents, abilities and gifts, other people benefit. I heard about keeping an encouragement file a number of years ago and began to keep these notes or other encouraging pieces of information. I must admit the “file” is not well maintained and all in one place which makes it difficult to pull it out on days I need to be built up and affirmed again. That organization is still very much a work in progress. Another part of the definition of affirmation includes validation. There are times I wonder if I have heard correctly what God is asking me to do – the direction I need to move in. 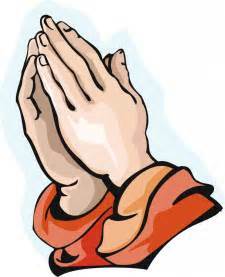 At times like this I have asked trusted friends and fellow believers for their prayers and input. I need some affirmation I have listened correctly. God has also provided affirmation from some unexpected sources. When I first thought God wanted me to move outside my comfort zone of teaching a ladies Bible study at our church, which was a relatively new comfort zone for me, I hesitated. Speaking to ladies ministry groups and at retreats had never been on my bucket list and I was not sure I wanted this to be God’s direction for my life at the moment. I shared it with the Bible study group. They affirmed the direction and I took a huge step of faith and let people know of my availability. The first ladies retreat I spoke at, only a few months later, was on the theme of prayer. What a huge and important topic and I studied for hours. I prepared by praying and asking friends to pray. I went to the retreat filled with peace at what I had learned in the process and yet apprehensive of this big challenge. I had a friend praying for me during each session. In the second session, as I was speaking, God told me to change my illustration. It was such a clear message I wondered if everyone had heard it. I did not want to change. I had things planned. I had prayed. I had prepared but I decided to obey God and change the illustration. Two ladies came to me after and said it was just what they needed to hear and a third lady came and encouraged all three of us. Wow God had a plan. Later that afternoon I had some quiet time to reflect, pray, and review my notes for the evening message. God spoke to me about changing my illustration for that night. He wanted me to share a very vulnerable time in my life that I did not want to share. I knew he had worked and brought people into my life at that time who had helped, encouraged, and build me up but I wanted to keep it to myself. I lost the argument with God and with much fear and trepidation I shared what God had asked me to share. It took until noon the next day for a young lady to come and talk to me. She had tears streaming down her face, crying so hard she could not speak. I prayed with her and simply let her cry on my shoulder. Finally she told me that she needed what I had shared. She had felt alone, like no one would understand. What if I had not listened and shared what God put on my heart. When I arrived home my friend asked me to share what had happened. When she had been praying in the morning session and around 4:30 in the afternoon, God had told her to pray I would change my illustrations. She told me she argued with God, knowing how much prayer, preparation and study I had done. She lost the argument. God used this as an affirmation I was on the right path. I had heard him correctly. 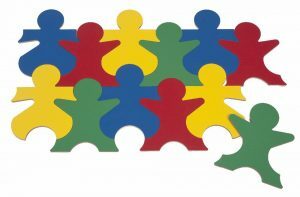 I pray that our words to each other will be positive and build others up, affirm the gifts you see in them and encourage them, especially when the puzzle pieces of life do not seem to fit. What stories of affirmation do you have? Do you have an encouragement file – notes that build you up?